The Facilitating the Implementation of IFSB Standards (FIS) E-Learning Portal is a comprehensive online learning suite of E-Modules based on key IFSB Standards. The modules are designed to augment IFSB’s implementation activities by way of facilitating capacity development in skill areas relevant to the effective regulation and supervision of the Islamic Financial Services Industry. Essentially, the E-Learning Portal complements the current implementation activities being conducted by the IFSB, including the FIS Workshop Series and technical assistance which are aimed at increasing the understanding and adoption of the Standards, Guidance Notes and Technical Notes issued by the IFSB. The FIS E-Learning Portal provides IFSB Members, and non-Members, with on-demand access to a wide range of standards, including IFSB-1, IFSB-6, IFSB-8, IFSB-9, IFSB-10, IFSB-14, IFSB-15, IFSB-16 and IFSB-17. The modules can be accessed at ifsb-fis-elearning.intuition.com. The Portal is hosted by Intuition, IFSB’s partner for the development and rollout of the FIS E-Learning modules, a leading professional education provider to the financial services industry. The modules are available to both IFSB Members and non-Members for an annual, renewable subscription. For IFSB Member organisations, a limited number of free access licenses will be provided per organisation depending on the membership category. To register for the E-learning Portal, organisations can email their request to ifsb_fis@intuition.com. The modules that are currently available on the learning catalogue of the IFSB FIS E-Learning Portal are listed below. 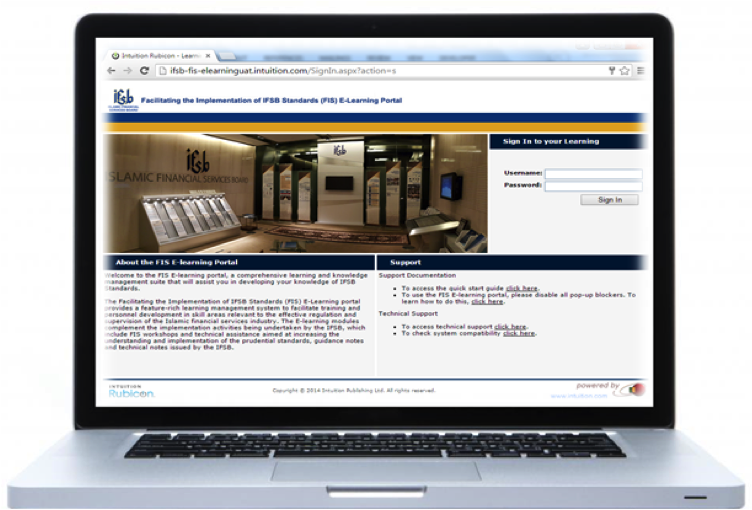 The benefits of the IFSB FIS E-learning Portal include easy, on-demand, and cost-effective access to learning content for institutions wishing to expand their knowledge of prudential standards for the Islamic Financial Services Industry.